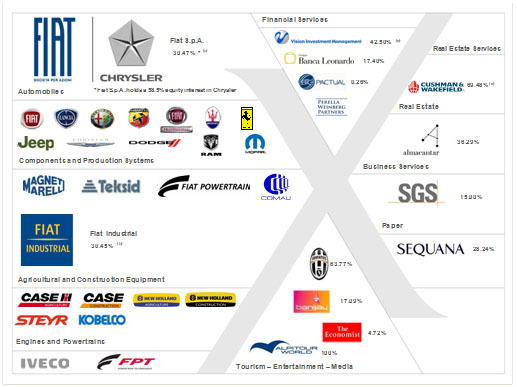 Listed on the Italian Stock Exchange, EXOR has a Net Asset Value of more than €6 billion at December 31, 2011. The Company is headquartered in Turin, Italy, Via Nizza 250. Fiat Industrial 30.45% of ordinary share capital, 30.09% of preferred share capital and 21.69% of savings share capital and with Fiat also holding 3.1% of ordinary share capital) is listed on the Electronic Share Market (Mercato Telematico Azionario) of the Italian Stock Exchange (Blue Chip segment) managed by Borsa Italiana. Created in January 2011 from the demerger from Fiat, Fiat Industrial operates through businesses that are all major international players in the sectors of trucks, commercial vehicles, buses, special vehicles (with Iveco), tractors, agricultural and construction equipment (with CNH – Case New Holland), in addition to engines and transmissions for those vehicles and engines for marine applications (FPT Industrial). Fiat (30.47% of ordinary share capital, 30.09% of preferred share capital and 23.59% of savings share capital) is listed on the Electronic Share Market of the Italian Stock Exchange (Blue Chip segment) managed by Borsa Italiana. Founded in 1899, the Fiat Group today is an international group with a clear focus in the automobile sector that designs, produces and sells cars for the mass market under the Fiat, Lancia, Alfa Romeo, Abarth, Fiat Professional brands and luxury cars under the Ferrari and Maserati brands. Its portfolio has recently been expanded to include the Jeep, Chrysler, Dodge and Ram brands, with models produced in North America now being distributed in Europe through the new Lancia-Chrysler and Jeep sales networks, which together count more than 1,000 dealers. Fiat is also active in the components sector through Magneti Marelli, Teksid and Fiat Powertrain Technologies and the production systems sector, through Comau. C&W Group (69.48% of share capital) is the largest privately held company for real estate services. C&W Group has its headquarters in New York, where it was founded in 1917, and has 243 offices and about 14,000 employees in 60 countries. Almacantar (36.29% of share capital) is a company active in the real estate sector which realizes commercial investment and development opportunities, mainly in the offices market in London. Juventus Football Club 63.77% of share capital) is listed on the Electronic Share Market of the Italian Stock Exchange. Founded in 1897, it is one of the most prominent professional football teams in the world. Antalis (100% holding), the leading European group in the distribution of paper products and packaging, with over 6,000 employees in 45 countries. Perella Weinberg Partners (2.00% interest in the limited partnership NoCo A) is an independent company that offers financial advisory and asset management services in the United States and Europe. (100% of share capital) is the largest integrated Italian tourism group. It operates with about 3,000 employees and has 3.1 million customers across all areas of the tourism business: Tour Operating (Alpitour, Francorosso, Villaggi Bravo, Viaggidea, Karambola, Volando, Jeans and Welltour), Hotels (Alpitour World Hotels & Resorts), Incoming (Jumbo Tours), Aviation (Neos), Distribution (Welcome Travel Group, with a 50% stake and Bravo Net – HP vacanze). (*) As described in “Significant events in 2011” and “Significant events in the first quarter of 2012”, contracts were signed for the sale of the investments in Alpitour and in Vision Investment Management, subject to conditions precedent which will occur in the first half of 2012. (approximately 42.50% of capital post-conversion), founded in 2000, is one of the most important hedge fund managers specialized in Asian markets. The following chart is updated to the end of March 2012 and presents the major sectors of business in which the Group has investments. Percentage holdings refer to ordinary share capital. (a) EXOR also holds 30.09% of preferred share capital and 23.59% of savings share capital. (b) EXOR also holds 30.09% of preferred share capital and 21.69% of savings share capital. Fiat also holds 3.1% of ordinary share capital. (c) Post-conversion of convertible bonds. (d) Percentage interest held in the limited partnership NoCo A LP.